On Saturday, September 1st, T.E.A.L.® kicked off National Ovarian Cancer Awareness Month with the lighting of Luna Park’s Parachute Jump in Coney Island the color teal for the 4th year in a row! 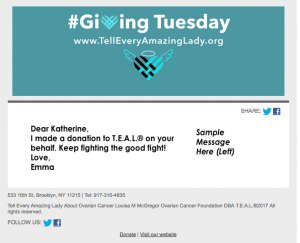 In addition to this, T.E.A.L.® partnered with the Brooklyn Cyclones whom allowed our CEO, Pamela Esposito-Amery, to throw the first pitch, and later awarded her with a “Winning Woman” award. An amazing opportunity to raise awareness! Follow the link to read our featured story in the Brooklyn Reporter, https://brooklynreporter.com/2018/09/coney-island-parachute-jump-lights-t-e-a-l-for-ovarian-cancer-awareness-month/ .